Monticello, Utah — Just like that, a political spat cost Wagon Wheel Pizza a customer. At least that's the rumor. In San Juan County, where a national monument controversy permeates neighborhood chit-chat, Susan Peebles small-talks with a regular from behind the counter in her pizza joint. Peebles relates that someone angrily called to say their days of patronizing the pizza store were over. She was talking to a woman who had bussed up to Salt Lake City with her husband two days prior, on Dec. 4, to support President Donald Trump's signing of a proclamation that shrunk Bears Ears and Grand Staircase-Escalante national monuments. The customer tells Peebles she wasn't fazed by the protesters outside the Capitol—and then as if to demonstrate how easy it is to brush off the opposition, she heads out the doors of Wagon Wheel into the afternoon air wearing a wide grin. For some, avoiding contention isn't as simple. Wagon Wheel received the irate phone call the day after Trump's visit, Peebles tells City Weekly, because her business is located in a town that took an official position against Bears Ears National Monument. "It was a message that they're not going to be supporting San Juan County anymore," she says. "There are so many different views and ideas that people have. I personally can't say that I have enough information to understand the whole controversy of who's getting what. It's all operated by the [Bureau of Land Management]. Why make it a monument? What's a monument? Why is a monument different than just being BLM land?" Peebles said the caller claimed to visit San Juan County often and always stopped in her eaterie, one of the county's oldest operating restaurants. Angered by Trump's declaration, the anonymous caller opted to boycott the entire region. However, Interior Secretary Ryan Zinke couldn't have been more pleased with his boss. On Dec. 4, the cowboy cabinet member from Montana lauded Trump for his leadership, for championing rural communities and for being "a man of his word." 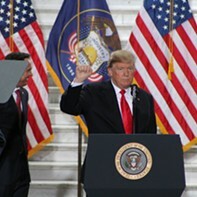 Zinke voiced his approval from a stage in the Utah State Capitol rotunda that was adorned with flags and flair, bright lights and a press pool, to make official what had been leaked days before and anticipated by anyone paying attention for several months: Trump was in Utah for the first time since winning the presidential election to cut to size a couple of controversial national monuments. "This is about us. 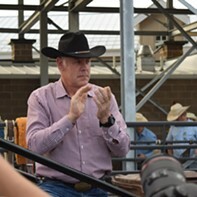 This is about giving rural America a voice and giving the great state of Utah a voice on how and when and what and why we love our land, giving the local voice back to America," Zinke said. 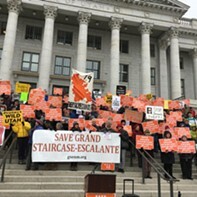 The crowd inside the Capitol punctuated the most salient moments that day with loud cheers, thrilled that the special-interest groups and Washington bureaucrats would no longer be able to control vast swaths of public land in southeastern Utah. As celebratory as the scene was, however, the narrative is contradicted by the Native Americans and rural Utahns who have petitioned the government for half a decade to create Bears Ears National Monument. Many of the state's elected leaders were eager to reverse President Barack Obama's decision to designate 1.35 million acres in southeastern Utah as Bears Ears National Monument. One of the president's final actions, Obama signed the proclamation on Dec. 28, 2016, less than a month before he left the White House. In the aftermath, a convoy of officials traveled south to San Juan County for an anti-monument demonstration. House Speaker Greg Hughes made the trek. "The pain that I saw in the eyes of the people that were there on Main Street right outside the San Juan County Building. 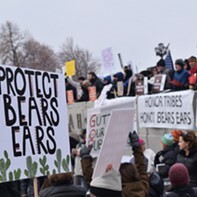 The people, the Native Americans, the people that were there felt like the implication was they weren't good stewards of their land," Hughes told a crowd in the statehouse. When the Legislature convened in January, Hughes introduced a resolution asking the federal government to rescind Bears Ears. It sailed through the legislative body and was one of the first items that session to be signed by Gov. Gary Herbert. "Here we stand today, this tiny little state. 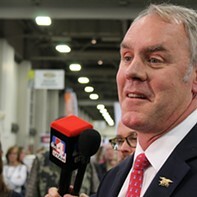 Those voices that didn't know if they'd ever have audience with the president of the United States or Secretary Zinke, who's here, who flew here in May, went and met with all the stakeholders and had a process," Hughes said. "The little guy's voice was heard. Our community's voice was heard." A San Juan County commissioner and member of the Navajo Nation, Rebecca Benally hails from two communities at the heart of the controversy—and she vehemently opposed the national monument. Speaking at the Trump rally, Benally embodied a perspective that is unique to San Juan leaders who felt disheartened the day the monument was announced. They found it vexing that 1.35 million acres in their county had become political turf to uninitiated outsiders. "People who have never been to San Juan County and could likely never find us on the map, people who don't understand our culture and tradition and histories, people who don't care about us, these are the people who have defined a narrative and passed judgment on us," she said. 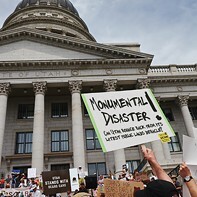 The creation of a national monument amounted to "nothing but a land grab" that benefitted a select group of non-government organizations, she said. But Trump's arrival marked a new day; Benally expressed gratitude. She thanked Zinke for visiting her county on his fact-finding listening tour last May; she thanked Sen. Orrin Hatch, R-Utah, for fighting to "rectify a wrong"; and she thanked Trump for "caring about San Juan County." Then Benally recognized the Navajo chapter houses for uniting together despite efforts to divide them—a bold assertion considering six of the seven Navajo chapters in Utah had voted to support Bears Ears National Monument, and the seventh abstained from taking a formal position. Meanwhile, Mary Benally, a Navajo from a small reservation community south of Bluff, who was standing outside the Capitol in the cold, didn't thank anybody. She felt sick to her stomach. Mary Benally is one of many San Juan residents who rejects the contention repeated by Utah's leaders: that outsider politicians and fringe environmentalists pushed for Bears Ears National Monument without insight from locals—a claim made often during Trump's visit. A member of Utah Diné Bikéyah, Mary Benally is part of a grassroots, Navajo-led nonprofit that advocated for the national monument as well as an inter-tribal coalition co-management plan. "Somebody in Washington actually listened to us and did what we asked, what we wanted," she says. About 11 months after its creation, Mary Benally watched as a years-long process to establish the national monument was undone. Also on the Utah Diné Bikéyah board, Jonah Yellowman too felt deflated by the president's proclamation. "All of those people that we live with, our relatives, we use Bears Ears area. We go out there and gather wood, that's our everyday life," Yellowman says. "We're all for it." Whether or not a national monument proves to be prudent, Native Americans with a sacred connection to the land and San Juan conservationists were the forces behind Bears Ears, Utah Diné Bikéyah says. Not Obama. Not former Interior Secretary Sally Jewell. Not Patagonia Inc. or any likeminded outdoor retailer. The Saturday before Trump's visit, a massive gathering of protesters congregated on the Capitol's front lawn slope. At a long table to the east, swarms of pro-monument types purchased T-shirts from Utah Diné Bikéyah. Program Director Cynthia Wilson did her best to keep up with the customers. The money, she said later, would help pay for the nonprofit's expenses—including a potential lawsuit. Tribal elders, Wilson explains, mapped out the original borders for Bears Ears National Monument, about 1.9 million acres comprising ruins and spots where Navajos perform ceremonial rituals, hunt, and pick piñon and berries. Although the Obama administration only designated 1.35 million acres, the inter-tribal coalition considered it an acceptable compromise. The San Juan County Commission, as well as the city councils in Monticello and Blanding saw it as gross overreach and passed resolutions in opposition. But there are locals who supported Bears Ears, advocates say, you just have to drive farther south. Bluff is an off-kilter town 25 miles south of Blanding, attuned to the seasons. In the winter—the slow months— most of its businesses and motels close up shop, but 200 or so locals call it home year-round. It's inhabited by outfitters and archeologists, small-business owners and avant-garde artists, like the calloused-handed Joe Pachak, who on a mid-week afternoon toils in an open dirt lot off the main drag, binding branches together. His creation is a 15-foot-tall effigy. On Dec. 21—the winter solstice, or as Pachak puts it, "the real end of the year"—the figure will be set ablaze. A semi-regular solstice tradition, this year's effigy will resemble two dancing bears. "They are to commemorate the Bear Dance at the Ute Reservation," Pachak says. Pachak, a self-identified "Bluffoon" of 30 years, is dismayed by the destruction, pillaging and pot-hunting on public lands. "The federal government has not protected this land well at all," he says. "As far as I'm concerned, it needed protection." A national monument, Pachak argues, wouldn't have necessarily provided that shield, but it might have sent a message: Southeastern Utah has precious antiquities that are as fragile as they are irreplaceable—so be wary and respectful. Pachak also believes a national monument would have established a framework allowing the government to execute a plan to protect the remaining sites that haven't been lost or damaged. Listening to the president, Pachak didn't think Trump grasped the area as a cultural gem. "He can't understand the situation that we're in," Pachak says, as he clamps a twig with a pair of pliers. "Through the eyes of archeologists and people who see the loss of the archaeological record as something really important, it's a tragedy." About six years ago, independent of the Navajos' efforts to conserve land and resources around Bears Ears, a nonprofit in Bluff called Friends of Cedar Mesa helped draft the Public Lands Initiative. Vaughn Hadenfeldt, a founding member of Friends of Cedar Mesa and chairman for the past three years, says the cultural differences between Blanding and Bluff—where Hadenfeldt bases an outdoor tour company—is a vast chasm. Hadenfeldt has long dirty-blonde hair and deep wrinkles on his face. He looks like a man who's spent many waking hours under the desert sun. A resident of Bluff is more likely to be a hiker who seeks solitude in the canyons, he says, where a Blanding resident seems to prefer to recreate on an ATV. As a community, Blanding is incensed by the federal government imposing rules on adjacent public lands. "They're used to doing what they want to with the land. And probably in the early days that was acceptable and people got used to that," he says. "Now, with more people coming and more impacts on the land and usage here, those kinds of attitudes just can't prevail anymore. You can't just go do what you want to do, and drive where you want to drive, and build a campfire wherever you want to build it." Uniquely, the Puebloan ruins at Bears Ears, he contends, require greater attention and protection than those in other wondrous public lands. "We're beyond a gorgeous drop-dead landscape," he says. "That landscape is full of cultural resources that are sacred to a lot of Native Americans. Their ancestry left all sorts of remnants of the past here, and we somehow have to start realizing that is important, too. It maybe isn't the history of the settlers who came here, but it is a deep history far longer than when the Hole in the Rock expedition came and founded the town of Bluff," he says. 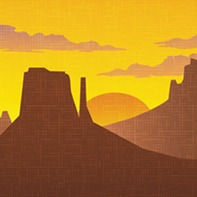 Friends of Cedar Mesa was instrumental in framing the Public Lands Initiative—better known as the PLI—a management document to provide protections for some of the resources. The group met with county officials over the course of three years, and the county was receptive. Eventually, the PLI was picked up by the Utah congressional delegation and introduced to Congress as an alternative to a national monument. Friends of Cedar Mesa jumped ship, Hadenfeldt says, when Rep. Rob Bishop, R-Utah, packed the PLI with "poison pills." From there, the Friends supported designating the land as a national monument. In July 2016, then Interior Secretary Sally Jewell visited Bluff and solicited comments at a packed public meeting. The morning before the town hall session, Hadenfeldt led Jewell and other dignitaries into the Bears Ears countryside along Comb Ridge to a famous rock-art site. From the couch of his Bluff home, Hadenfeldt recounts his excursion with Jewell, who was in southeastern Utah to determine whether Bears Ears should be a national monument. "I get her on top of Comb, and we're looking toward Bluff. I said to her, 'My concern was that you're not going to bring the boundary of the Bears Ears to the town of Bluff, which is really important for our town.' There's a lot of archeology right outside my door here." As he recalls, Jewell responded that she couldn't imagine recommending a border that was smaller than the PLI, which extended to Bluff. "At that time, I felt like our organization had won," Hadenfeldt says. By contrast, Hadenfeldt says when Zinke traveled to Utah last May, he appeared disinterested in what Friends of Cedar Mesa had to say. 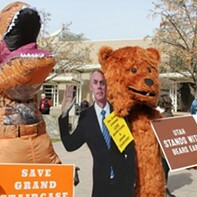 The organization was one of the only pro-monument voices to meet with Zinke, in the form of a 30-minute sit down at the Edge of the Cedars Museum, which serves as a repository in Blanding for archived archeology removed from the area. In the meeting, Hadenfeldt told Zinke that 30,000 cultural sites, of an estimated 100,000, had been recorded. "We know there's tons of sites, but they haven't been officially, on paper, recorded as an archeological site," Hadenfeldt recalls. "He looked at me and said, 'So that's what you really have here: 30,000 sites.' At that point, I knew I was kind of bucking up against someone who has a quite a different attitude toward cultural resources." On its website, Friends of Cedar Mesa compiled a photo montage of more than 100 archeological sites that are outside of the new national monument borders. "It's incredible what kind of reduction of cultural resources just occurred here," Hadenfeldt says. Before Zinke flew into San Juan County, tribal leaders invited him to meet with them at the Monument Valley Welcome Center, according to Wilson. Zinke never responded. By the time he arrived, groups like Utah Diné Bikéyah were scrambling to find him. "His whole agenda was based on the San Juan County commissioners," Mary Benally says. "None of us knew that he was going to be at Blanding at some park. We were just excluded from the whole thing. We didn't know his schedule. We were just trying to follow wherever the media were." "He came down, [but] he didn't listen to us," Yellowman adds. "We tried to meet with him. He just got on his horse and galloped away." The inter-tribal coalition was so concerned that Zinke would not consider its perspective in his recommendation, that its leaders tried to bypass him and sent a letter directly to Trump. "We believe you may not be receiving an accurate picture of Bears Ears, how it came to be, and how wide public support is for the Monument," states the letter, which was shared with City Weekly. "Respectfully, Mr. President, we want to meet with you on a government-to-government basis and set the record straight with you." The Trump administration never responded, says Natalie Landreth, Native American Rights Fund senior staff attorney. Officials in the county, Monticello and Blanding say Bluff residents and pro-monument Native Americans have it wrong: It was Zinke who listened, and Jewell who made a recommendation without consulting the locals. They saw Obama's proclamation, signed while he was in Hawaii, as a dismissive swipe at residents. Blanding City Manager Jeremy Redd acknowledges that one's perspective is shaded by his or her opinion of Bears Ears National Monument. Jewell, he points out, met in Bluff, one of the smaller communities in San Juan County. Reports of the July 2016 meeting, however, note that pro- and anti-monument people were able to express their views. Though on different sides of the debate, Redd and Hadenfeldt agree on one important detail: The proclamation signed by Obama on Dec. 28, 2016, didn't actually affect much on the ground. "Nothing has changed. It was federal to start with. It received a new designation, and the new designation didn't do anything," Redd says. "And now that the designation has been shrunk, it's still BLM and Forest Service. They're still in charge of what happens, and people can still come and visit. There's no bulldozers waiting to push the whole thing over. There's no oil rigs waiting at the edge of the canyons to get started. It's going to be the same." Redd says residents worry that a national monument would attract scores of tourists to a place the federal government wasn't funding properly. In fact, following the designation—coupled with the ensuing media circus—Blanding experienced a dramatic uptick in tourism. "We're seeing about a 30 percent increase in our visitation through our visitor center and our local transient-room tax in this year, 2017," he says. Years prior, Blanding, a midway point between Arches National Park and Monument Valley, had experienced an 8-10 percent climb in tourism. 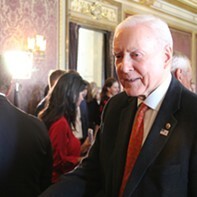 A designation could also open up an avenue for onerous regulations down the line, Redd adds. Hadenfeldt says the increase in traffic that San Juan County experienced year after year was the impetus to protect Bears Ears. Initially, Hadenfeldt wasn't concerned whether that protection was provided by the PLI or by the president through the Antiquities Act, a 1906 law that allows the executive branch to set aside land for preservation. Language in the law grants the president the authority to establish a monument in the "smallest area compatible with proper care and management." Bears Ears opponents highlight this clause as evidence that the 1.35 million acre national monument violated the law. "That's what the Antiquities Act is all about, for God's sake, is protection of cultural resources," he says. "If this place doesn't deserve the Antiquities Act [protections] there is no place in this country that would qualify. This is the epicenter. This has more archeological sites than any national park that we have or anyplace else in this country. It makes Mesa Verde look like a little spot with some ruins." 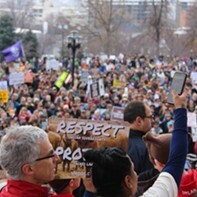 Hadenfeldt concurs that the proclamation creating Bears Ears National Monument allowed for the same types of activities on the land that were permitted before. He suspects rumors that the national monument would block access was a tactic used to foment fear. "This other problem that I see rampant around here is the misinformation, [such as], 'We can't graze there anymore. We can't collect firewood there anymore. We can't go hunting there anymore.'" he says. "None of that changed. It was actually written into the proclamation that those things will continue to occur. "To listen to all of these country folks trying to tell Navajos, no more firewood, you won't be able to go hunting there anymore or collect native plants," he continues. "None of that changed. It's such a bold-faced, outright lie." Jack Gillis, a medicine man protégé who learned the practice from his father and grandfather, sips coffee inside the Olde Bridge Grill Café in Mexican Hat, Utah. Speaking in a slow baritone, he frequently sprinkles in metaphors and similes to underscore his point. When people allude to Native Americans who visit Bears Ears for traditional purposes, they're talking about people like Gillis and his ilk, who cache firewood they've retrieved off its buttes, who pack out herbs for cooking and other medicinal use, who retain generational knowledge. "I grew up with it," he says. "My father used to be a real medicine man." The soil is rich with stories, too. From his forefathers, Gillis heard the tale of Navajos climbing to the highest geological formation to survey the land, keep an eye out for invading settlers and to pray. In his communion, Gillis talks to nature: the rivers, the mountains, the herbs. Finding ruins in the area takes minimal effort. A mile-long hike on dirt and rain-smoothed stone leads to the Butler Wash Ruins Overlook. Cairns and wild plants mark the path until you reach a fenced overlook. Across the ravine, brick walls built 700 years ago by Anasazi Indians stand in the natural cliffs. The structures were domestic and spiritual, used as homes, as well as storage space and ceremonial grounds. The Mule Canyon Ruins, which features the foundation of a small village, sit in the distance. You can peer down into a circular, brick wall pit that connected through an underground tunnel to a two-story tower and a 12-room living area. As for the monument, Gillis prays that the land will remain protected and accessible. He places a great deal of faith in a higher power. The protracted fight, he says, is like a football scrum. It's impossible to make sense of who has the ball, but that doesn't stop more and more bodies from diving onto the jumbled pile from various angles. It's confusing, hard to determine who's winning and what they're grappling at. "Even the referee doesn't know," he says. Marlo Allen owns Olde Bridge Grill Café, an end-of-the-line diner before you cross over the San Juan River into the Navajo Reservation. Her extended family travels from the reservation to Bears Ears to gather firewood, a right that was enshrined in the Obama proclamation. Across the bridge, the country opens up around you with rolling sagebrush range on either side. Headed south, you'll hit a straight stretch of road that dips down a long descent into the valley, and if you drive along at the right time of evening, the sandstone spires of Monument Valley will stand out in an unforgettable monolith silhouette before a jaundiced skyline. Gillis says the central rock features resemble a medicine man and a patient; they're praying to Rock Beings to the east. "They might have been alive one day," he says. As day turns to dusk, stoop lights on modular homes in the distance start twinkling. But for the glow, you'd zoom past the houses, presumably with Navajo residents inside, without noticing them. In Salt Lake City, Yellowman highlighted how the government silenced Navajo voices when it reserved Bears Ears. "All those years that we did what we did, all the planning, we wanted people to understand that we're just as human as anybody else," he said. "We're still here and we want to be known. We want people to see us."